The Jerusalem Klezmer Band was founded by Avrum Leib Burstein in Jerusalem some twenty years ago. This unique group of musicians play original Klezmer songs passed on for generations, from father to son, a combination of Yiddish and Hebrew melodies that originated in Eastern Europe up to 1000 years ago. Their show is a mesmerizing combination of dance, theater and music which all together tells the story of Hassidic life and culture. Twice a year, in spring and fall, they go on tour in Europe. The six musicians play clarinet, trumpet, violin, flute, accordion, and drums. 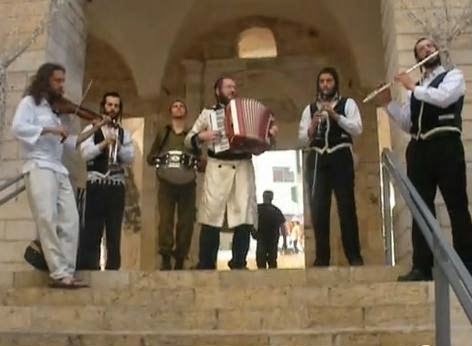 One of the places where they put on a spontaneous performance in Israel is on the steps of the Mamilla Mall in Jerusalem, a venue that attracts all types of musicians and dance groups, some of which we have featured here on Jewish Humor Central. In this video, the Jerusalem Klezmer Band plays a spirited version of Shalom Aleichem, the melody that is sung throughout the world as Shabbat is welcomed on Friday night. Here the group took to the streets of Jerusalem on a Friday afternoon before the onset of Shabbat. Enjoy, and Shabbat shalom to all!